Quantity: Minimum 150 pieces. For orders above catalog quantities, please contact your distributor for production time. Medium Point: Includes Black, Blue, Red and Green Ink. 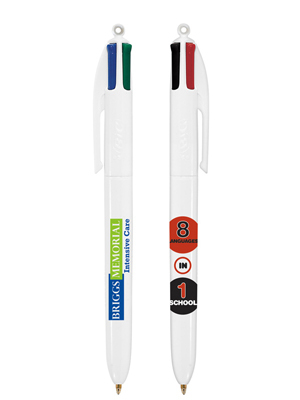 White barrel with green, black, red and blue ink in every pen! Imprint Area: 1 3/4" x 1 1/16"